Happy Diwali folks! Honestly, I've had a rough few weeks and this lookbook is literally coming out on Diwali day which I know isn't ideal but I hope it helps all you guys who are like me and have been working like crazy while trying to keep healthy at the same time. 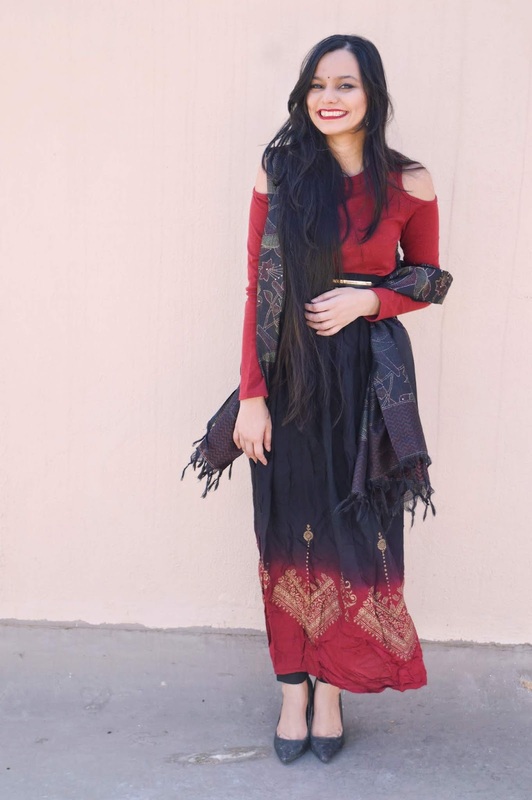 Or if you ended up with five hundred diwali party invitations for the week and can't actually afford to buy new outfits for every single party, this post is going to help you mix in your Diwali pieces with everyday clothes to create new, interesting (well, atleast for me) outfits! So with the festive spirit, let's dive into this post. We're starting off with something that is super simple and uses two of my favorite things, a simple white shirt (and you KNOW I absolutely love it!) and a denim jacket. This look is for breaking up and using your regular office pieces. I added a denim jacket simply because I think that's a great addition to the regular look. If you're looking for an outfit for a house party, this could be the look for you. This look is for people who like minimal Diwali outfits. One thing that I always notice when I see the crazy expensive celebrity Diwali outfits is that they are actually quite minimal. If you're trying to look put together but still not worry about looking too loud, wearing a monochrome outfit makes you look well dressed and actually doesn't require a lot of effort. Just match shades and you're good to go! While I love wearing sarees as half-sarees, this look is actually highly inspired by something I saw on a draping website and think it looks so fierce. 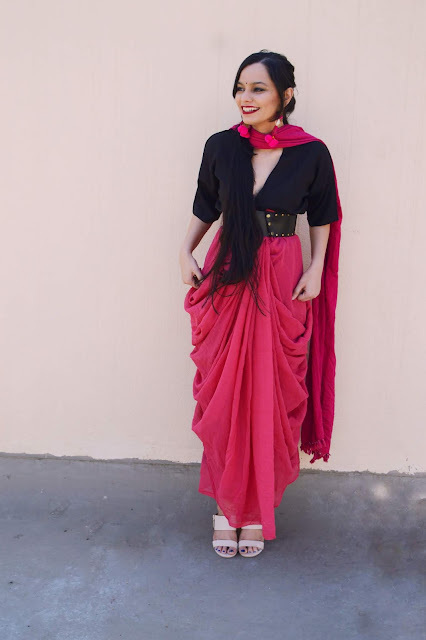 Draping has so many variations out there at the moment and I just had to create this look as we cannot not include a saree in an Indian outfit roundup. However, this look can be done with any plain saree too, you don't need an expensive fancy saree (the one I'm wearing is Rs. 1313) and just add the pleats to make it look good. I layered it over a plain black jumpsuit and the overall look is simple but striking! This is yet another thing you've seen before. I've actually seen Komal Pandey show this with a ridiculously heavy lehenga and girls, I have my doubts on that if we're being honest but I like the idea. I added a simple maxi skirt to a full sleeved cold shoulder t-shirt and added a belt to make sure the skirt is secure in place. A pair of trousers masquerading as leggings and a black dupatta and you have your very own DIY anarkali. 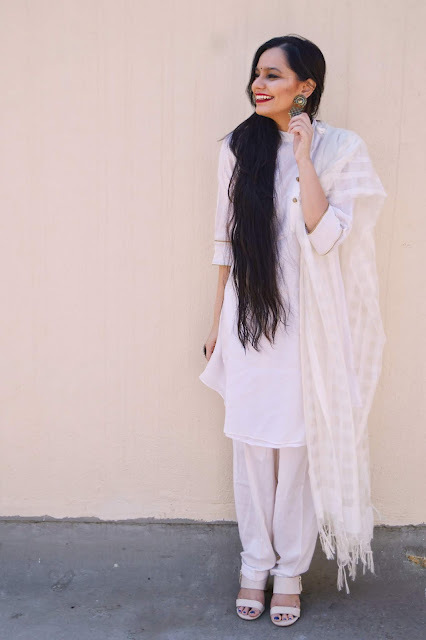 If you aren't a dupatta girl, you can most certainly skip it and wear this outfit the way it is with a pair of statement earrings and a whole lot of twirling! Finally, if you're someone who cannot NOT wear their denims, even if it is the festive season, this look is for you. You can turn an uber casual outfit into a dressy look by simply throwing on a statement jacket. I'm using a jacket in a jacquard fabric that does all the work. If your statement piece isn't as long as mine, you can definitely wear what you have. Anything with an ethnic print or even a button down with an ethnic print or a shirt dress in something earthy works just as well. The trick is to add those pieces as layering pieces that can make your look go from everyday to boho chic. I hope this post isn't too late for you to get some last minute inspiration for Diwali. 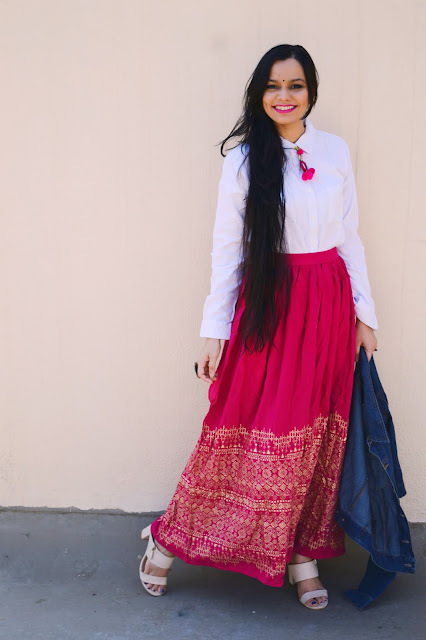 Since we've just finished Navratri, I've actually reused a lot of pieces I wore for the Navratri style series since I firmly believe that you should be able to get the most out of the super expensive outfits that you buy for festivals and special occasions. If you enjoyed this lookbook please don't forget to comment down below with your favourite looks. I love hearing from you and it means a lot when you take the time to tell me your thoughts! Have a safe and Happy Diwali!